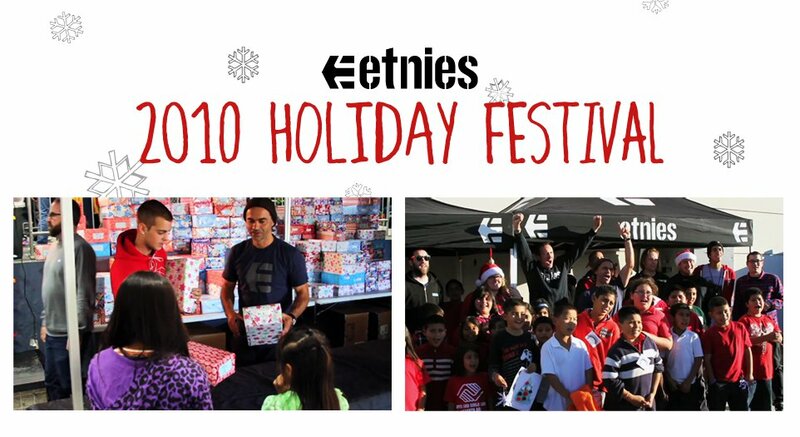 Last Thursday, the good people over at etnies continued their annual tradition when the brand hosted its 2010 Holiday Festival. Several of skateboarding's biggest stars showed up for the occasion, including Ryan Sheckler, Devine Calloway, Tyler Bledsoe, Kyle Leeper and etnies CEO Pierre-Andre Senizergues. While the big names created a tremendous amount of excitement, the day was all about the children. About 580 kids in need of a little Christmas joy were in attendance for the big festival, each receiving a brand new pair of etnies kicks. In addition, "The Big Guy" Santa Clause was in the house to spend a little time with the kids as well. Just when you think you've seen it all, Santa hopped on his board to show off some of the new tricks he's learned since we last saw him. Check out the 2010 etnies Holiday Festival video below.